Lawyers for a Briton accused of hacking into secret military and Nasa computers are asking the home secretary to ensure he is not jailed in the US. 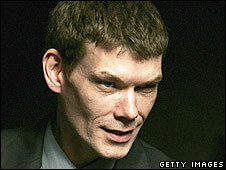 Glasgow-born Gary McKinnon, 42, who last month lost his appeal against extradition, could face life in jail if convicted of accessing 97 computers. His lawyer Karen Todner said his human rights would be breached if he did not return to the UK after a trial. The Home Office said his case was "receiving consideration". A spokesman said: "Further representations have been received today from solicitors against Mr McKinnon's surrender to the USA which are receiving consideration." Unemployed Mr McKinnon, from Wood Green, north London, was said to be "distraught" after losing his extradition appeal to the European Court of Human Rights. He has admitted breaking into the computers, but says he sought information on UFOs and only got in because of lax security. The US government, however, insists he committed a malicious crime - the biggest military computer hack ever. They say he stole passwords, deleted files and left 300 computers at a US navy weapons station unusable immediately after the September 11 terrorist attacks. Ms Todner said she had written to the Home Office asking for an intervention on her client's behalf. She said: "We have requested that the home secretary obtain an assurance from the United States government that Mr McKinnon be returned to the UK immediately on receiving a sentence in the US, should he be extradited. "It is standard practice for both the Dutch and Israeli governments to seek this assurance on behalf of their nationals who face extradition to the United States. "In light of Mr McKinnon's being diagnosed with Asperger's Syndrome, it would seem to be highly appropriate that the home secretary obtains this assurance." Mr McKinnon was arrested in 2002 but never charged in the UK. He first lost his case against extradition at the High Court in 2006 before taking it to the highest court in the UK, the House of Lords. His lawyers want his case to be tried in Britain, arguing that the alleged offences were committed on British soil. James Welch, legal director of human rights group Liberty, said: "Clearly it is time to re-think summary extradition when US prosecutors threaten to 'fry' a non-violent computer hacker. "It is a shame that the Court of Human Rights will allow his extradition even as they consider whether US extradition measures were fair." A demonstration in support of Mr McKinnon will take place outside the Home Office on Tuesday.